In today’s feature we take a look at San Diego Padres pitcher Keyvius Sampson as he chases his way to a job in the major leagues. So far during his professional career all Sampson has been doing is proving the doubters wrong as he continues to climb upward in the Padres organization. Putting himself on the map as one of the top prospects in a system that is loaded, making the Padres one of, if not the best minor league system in all of baseball. Every player faces doubters and struggles during their professional career. In today’s feature we take a look at San Diego Padres pitcher Keyvius Sampson as he chases his way to a job in the major leagues. So far during his professional career all Sampson has been doing is proving the doubters wrong as he continues to climb upward in the Padres organization. Putting himself on the map as one of the top prospects in a system that is loaded, making the Padres one of, if not the best minor league system in all of baseball. Even before the Padres drafted Sampson there where doubters and naysayers. Growing up in Florida, Sampson attended and played baseball at Forest High School in Ocala. Sampson’s high school baseball career came with many ups and downs. As a fifteen year old in high school, Sampson got caught up in some trouble with the law. The right-handed pitcher, was arrested and charged with a first-degree felony after he drove friends who had weapons in their possession to the movies. Sampson did not know they had weapons in their possession at the time but was still charged in the event. He accepted full responsibility for his actions. Part of his punishment however was he was suspended from school and the baseball team he loved. This wasn’t the only traumatic event for the youngster. In April of 2007, his mother, who was in a fight of her own with cancer, died of a heart attack. The combination of these events had the hurler thinking about quitting baseball. Sampson however decided he would continue on playing every game in honor of his mom. Right around this time a one time coach of Sampson, Scott Carpenter took the young Sampson in and served as his guardian. With Carpenters assistance on and off the field Sampson started to turn things around. Having the support of not only his own family but the Carpenters, Sampson was back playing at Forest High School. As a senior he put together an incredible season, he went 9-1 with a 0.84 ERA and 134 strikeouts. These numbers earned him the Star-Banner’s pitcher of the year and he skyrocketed up draft boards all around major league baseball. Throughout all the ups and downs Sampson kept working hard and earned himself a scholarship to continue his baseball career at Florida State University. With his sights set on Florida State, word began to spread that if drafted Sampson would be a very difficult to sign. In fact of the top 200 prospects in the game, Sampson was maybe the only one who did not have an advisor selected with experience in the world of baseball. Instead it was his Guardian, Scott Carpenter who would help and advise him through the process once the draft came. The draft did come and with their 4th round pick in the 2009 draft the San Diego Padres selected the Forest High School star. The Padres liked what they saw in Sampson who packed a mid-90’s fastball as well as an advanced off speed package to keep hitters off-balance. 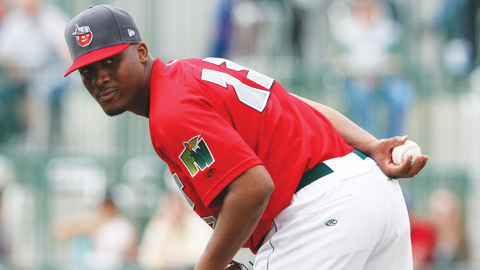 In his 2011 Debut with the Fort Wayne TinCaps Sampson pitched 6 perfect innings of baseball. Sampson returned to Eugene for the 2010 season but the right hander battled injuries all season long. This limited him to only 10 games started for the year. He posted a 3-3 record and a 3.56 ERA over the course of 53 innings. The right-hander posted an extremely impressive strike out ration of 12.1 per 9 innings. During the season Sampson battled both shoulder and elbow problems. Some scouts and people around baseball doubted Sampson before and after he became a Padre. Standing at 6’0 tall some people questioned if he was not tall enough to be a durable pitcher. Others questioned if his delivery would allow for his shoulder and arm to hold up over the course of his career. Due to these injuries in 2010 the doubters were out in full force. As the 2011 season got underway it was an important one for Sampson, not only did he want to rebound and continue to build on what he had done when he was healthy in 2010 but he wanted to once again prove the doubters wrong and stay strong and healthy for a full season. The Padres assigned him to the Fort Wayne TinCaps of the Midwest League. To kick off the 2011 season, Sampson did it in style pitching 6 perfect innings and setting the tone for the rest of his season. Sampson stayed healthy and strong all season long quieting some of his doubters. Starting in 24 games for the TinCaps, Sampson went 12-3 with an ERA of 2.90. He was able to pitch a professional career high of 118 innings and stuck out 143 batters at a rate of 10.9 per 9 innings. During the off-season, publications such as Baseball America, Baseball Prospectus and Mlb.com named Sampson as one to the top ten prospects for the Padres entering the 2012 season. As we near the start of the 2012 season more challenges await Sampson. If the Padres bump the right hander up a level he could find himself pitcher at Lake Elsinore in the California League. Normally the California League, a hitters paradise, is an extreme challenge for even the best pitchers and statistics are not always what they seem. Sampson is used to challenges by now. He has taken each one head on and fought hard to not only become a better player on the field but a fantastic individual off the field. We will be following Sampson all season long as he potentially battles on the fields of the California League. Please give Keyvius a follow and interact with him on Twitter at @K_Samp2. Please also follow our site at @CTD_Sypien for updates on all the players we feature here on the site. It was an honor to be drafted, I was actually in my bed laying down sleep because i had already decided to go to school. After being drafted what was the signing process/experience like? It was very long. I didn’t get a call tell close to the deadline, but I had my mind-set on school. I throw 4 pitches Fastball (2 seam & 4 seam), curveball and change-up. My strength is my fastball and change-up. I have pretty good command with them. My breaking ball is my weakness still working on that. It’s coming along though. Meeting new people and my teammates. It’s like a brotherhood. Is there any coach or instructor that has really helped you so far in your pro-career? If So – Who is it and Why? I can honestly say every coach or instructor I’ve yet to come across has helped me in some way. If it’s mentally or physically, I’m fortunate to have the help that’s came along with my pro career. Who has been the toughest batter you have faced so far? That’s a tough question to answer, i’ve came across a lot of great hitters. Heading into spring training, what are you goals for the 2012 season? Any clue as to what team you may start out with in 2012? My goal is to go into ST healthy and ready to make a team. I don’t know where I’ll be. Favorite Baseball Player Growing up? Favorite non-baseball player? What would be your at bat song coming as of right now if you had to pick one? XBox/PS3/Other? Whats your favorite games to play?